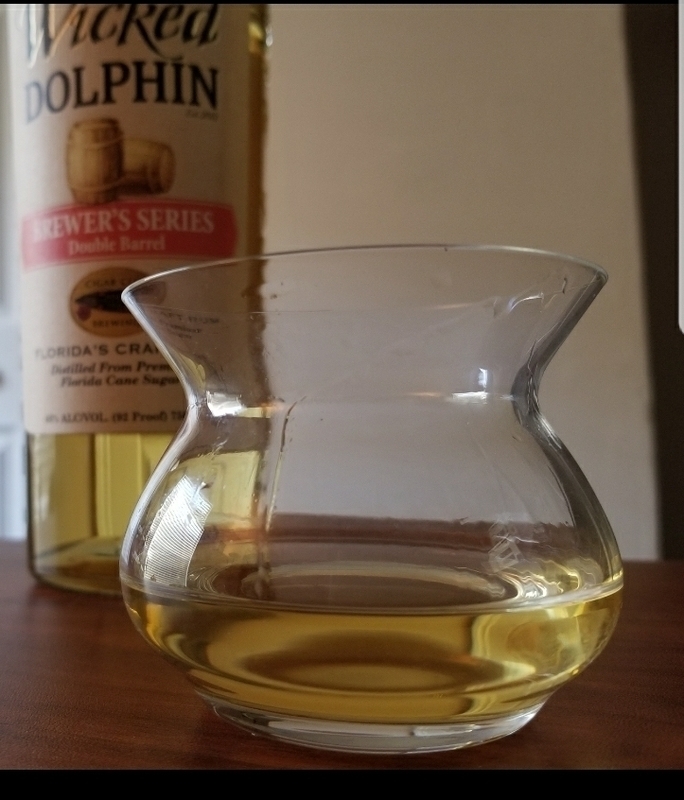 Have you found an online vendor selling Wicked Dolphin Brewer's Series Double Barrel? One of the local liquor stores had this on the shelf suddenly and being the adventurous soul that I am (well, relatively adventurous) I bought a bottle to take home. "Brewer's Series Double Barrel", eh? I wonder what that means. Flavor alchemy often occurs in craft distilleries, and Wicked Dolphin Rums are no exception. Their upcoming Brewer’s Series Rums embrace the barrels of artisan breweries with the Cigar City 92 Proof Rum leading the way. Cigar City and Wicked Dolphin share some of the distillery’s #3 charred American White Oak barrels in a unique process. • and finally holding our Rum again for an additional year. The life of the barrel is almost 7yrs!! That really imparts the flavor history of everything! !”"
The color of the rum is definitely straw and is clear. Swirling the rum in my snifter revealed good legs and a thin ring that slowly settled to the bottom. It has a mild and pleasant aroma that I find difficult to describe. Suffice to say I like it. The flavor is simply outstanding. Complex with hints of vanilla, butterscotch and a little spiciness. Some oak bite to it. What's remarkable is how smooth it is. No harsh burn whatsoever but a long-lasting warmth coating the throat. Surprising since it is 92 proof (46% ABV). The finish is a bit dry will that vanilla coming back. Definitely a sipper's rum. Nice with a bit of ice. Wicked Dolphin has a winner here. This rum was aged in bourbon barrels (2 years), then put and in bourbon/rum stout barrels (1 year), which gives it a very unique stout flavor. I think it has a little too much bourbon for my liking, but I like the stout, and I wished they had shortened or skipped the bourbon barrel aging. Smells and tastes of bourbon, chocolate, oak, vanilla, and even hops. I like it, except the overpowering bourbon flavor, which I believe makes it a bit on the dry side. Still, an interesting rum, and worth trying for something a little different. I like the story behind each rum as much as I like sipping the rum itself. As a Floridian, this bottle of rum brings together a popular local distillery with a very popular local craft brewery. Bourbon barrels that were used to age rum were given to the brewery for a special edition beer. The barrels were then given back to the distillery to further age the rum. The resulting flavor is a nice gold rum, suitable for sipping, with some hints of the creamy stout that shared the same barrel. My first beer-barrel rum was from Siesta Key (another Florida distillery), but it is a spiced rum and very different from this expression. I thought they would be similar, but no. Siesta Key has a sweeter spiced rum that highlights the beer flavors. This is more of a semi-dry gold rum with hints of beer. I poured it neat, and it is beautifully clear. There is a strong aroma of vanilla and cream. With a hint of sweetness, you want to lick your lips after the first sip, but it's not overly sweet. At 92 proof, it tickles the nose with a little burn, but goes down smooth. You're left with a floral oakiness that reminds of you of a good beer, but doesn't hit you over the head with the taste of beer.